The Billionty-Oneth Geek: 2012.... LOL!!!! It's been over a week since my last movie review, and boy, what a way to get back into things. But really, who's surprised? When the trailer first came out, I thought, oh cool, another low thinking, CG-littered, late season blockbuster. It could be fun. I later found out that Roland Emmerich was at the helm and abandoned all hope. Emmerich doesn't exactly have the hottest track record. His last 3 movies before this was 10,000 BC, The Day After Tomorrow and The Patriot... all of them pretty much crap. In fact, The Day After Tomorrow is almost the same as this movie; a global natural disaster movie. I think the last movie of his that I enjoyed was Independence Day. I should mention though that they were playing it on TV not too long ago, I watched it, and unfortunately it doesn't seem to hold up with time. 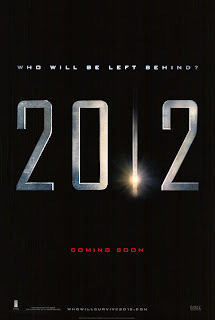 In short, 2012 is about the world getting destroyed for whatever reasons. We follow John Cusack's family as they narrowly escape action scene after action scene. There's a happy ending. The end. I think that's the biggest problem I had with this movie. It's a movie about Earth getting shat on by nature or God and yet it still has the balls to churn out a happy ending. Why couldn't it be a somber or ominous ending? I'd rather leave the movie sad yet contemplative than happy, thinking that John Cusack will one day rescue me if all this comes to fruition. Balls! My second biggest gripe was how long the effin' movie was! It clocked in at over 2 and a half hours! I was just waiting for it to end but it kept on going. I think after the 1 and a half hour mark, I just stopped caring. Scenes were poorly knitted together with characters I couldn't give a crap about sending my brain into auto-pilot mode. I think I started daydreaming about wrestling storylines as I am wont to do. Well, that said, I gotta give Emmerich credit; he knows how to throw money on the screen. Like with Day After Tomorrow, the best parts of the movie are when we get to see cities torn to shreds. It's just unbelievable and awe-inspiring seeing metropolises get swallowed up by the earth. But as I recall, the production budget for the movie was $200 million, which I'm sure is more than some country's GDP. Tis a shame. Think of the number of schools that this money could have built in third world nations. Had this movie been 80 minutes of scene after scene showing major cities getting destroyed, I think I would have been perfectly fine with it. It probably wouldn't have been a great movie, but I think I would have enjoyed it more than the crapfest we were given here. Like I said, give me a sad ending with something to think about, and I'd be fine. So folks, stay clear! For some inexplicable reason, it's still doing hot at the box office. Ignore all those knuckle dragging, mouth breathers though. You're smarter than that. Save your money. Go see Avatar. Or don't watch anything at all. There I saved you $10... now send me $5. Later geeks! You didn't like The Patriot! ?